BU junior defenseman Brian Strait (media guide, pg. 25) has been voted captain of the U.S. Junior National Team by his teammates. Assistant captains include Wisconsin’s Blake Geoffrion, Denver’s Tyler Ruegsegger and Michigan’s Chris Summers. Team USA began play in the IIHF World Junior Championships today against Kazakhstan. Audiocast link. Strait is paired on defense with New York Rangers’ draft choice Bobby Sanguinetti. Colin Wilson (media guide, pg. 29) is centering UNH’s James Van Riemsdyk and Minnesota recruit Jordan Schroeder. Coach John Hynes reunited the trio, which was the top U.S. line for the silver medal-winning squad in last Spring’s World U18 Championship. 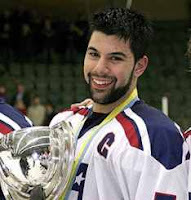 Two seasons ago, Strait was captain of the Team USA squad that earned the gold medal in the World U18 Championships. "He's kind of listened to everyone's advice: Just keep it simple, be a first-pass defenseman, hold the blue line, get it out, change, jump over the boards, do it again. In my last report, I really thought that he looked like an NHL defenseman. He did everything well, and he didn't make any glaring mistakes. He just kept it simple, and that's all he's going to do. He knows what he is."